I’ve always had a particular fondness for the pioneer British mainline diesels. Actually, let’s put it another way: I’ve always had a particular fondness for one-offs, oddities and prototypes. The latest commission to leave the workbench definitely falls into the latter category. In 1946, the London, Midland & Scottish Railway—at the time the largest company in the world—was looking to the future. Britain’s railways had effectively been ground into the dust as everyone and everything focused on winning a world war. The board of the railway agreed to invest cash in a speculative test of two diesel electric locomotives. Designs were drawn up in the Derby Works drawing office, and a partnership formed with English Electric, whose experience would furnish the power plant, electrical and control equipment. 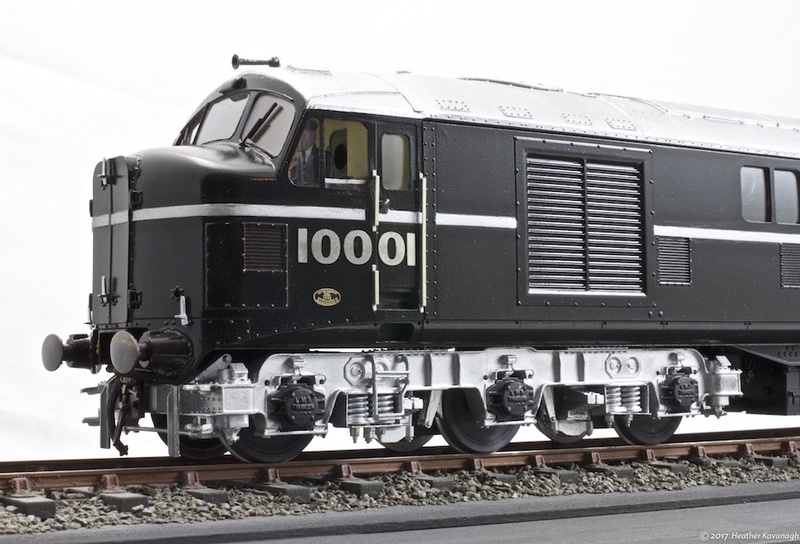 While diesels were commonplace in the United States, and much of that country’s experience was called upon, a design was created that set the standard for UK mainline diesel locos for many decades to come. Finished in a striking black and silver livery, the first loco to emerge from the works was 10000. It’s sibling was held back to ensure the LMS could extract as much publicity for its new machines as possible—just as Britain’s railways were nationalised. 10000, in fact, was unveiled to the public and press in early December 1947. After a few test runs and jaunts for the press, the unfinished loco returned to Derby for completion and certain improvements. Meanwhile, in early 1948, 10001 appeared with slightly less fanfare. Both locos continued to be updated and modified throughout their careers. They worked the Midland Region routes on a variety of trains, both singly and as a pair (termed working “in multiple”, where one driver could operate both units from a single cab). In the early 1950s, both locos were despatched to the Southern Region, where they were again tested on various trains. By the late 1950s, diesel traction was becoming more commonplace and eventually, being prototypes and non-standard, both locomotives were withdrawn. 10000 was scrapped in 1963, while 10001 lingered at the Derby works until 1966. 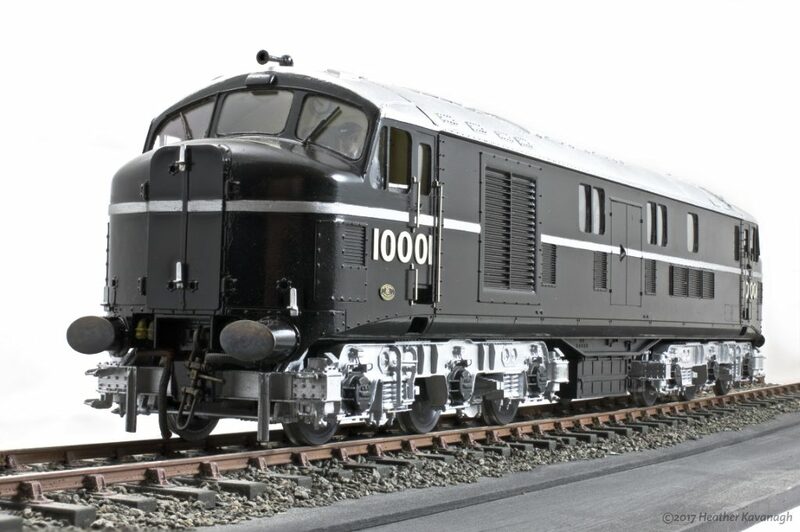 The model represents 10001 as it was delivered to British Railways in 1948. It has been built, to a scale of 7mm to the foot (1/43rd), using reference materials published by Wild Swan and a kit from Just Like The Real Thing. A cosmetic diesel engine has been installed, and the cabs have been detailed and painted as accurately as possible. Various other details have been added to make this model as true to the original as I could make it, though there have been some inevitable compromises made along the way. The model was commissioned by a client to match with his existing model of 10000. The latter model has also been remotored and given updated electronics, and both models have been tested together as a pair. Oddly, I have another model of 10001 under construction. This time, it’s as the loco appeared in 1953, so there will be some subtle external differences, although still in the striking black and silver livery. On a personal note, you will have noticed my blogging has been quiet of late. The state of the world, you’d think, would give me plenty to rant about. You would be correct, of course, but for the sake of my mental and physical health I am trying my best to keep the world at arm’s length. You should hear what I bellow at the television “news”, mind you! I also have had one or two issues with the WordPress installation, and I may need to think about extending my allocated server space. With plenty of other things on my plate, I’m afraid this blog has been rather neglected. I am a professional modelmaker. I take commissions for, in the main, 7mm scale model railway subjects. I have a full order book for the rest of 2017, and I’m already taking commissions for 2018. You can see some examples of my work on my web site, and if you like you can follow my antics on that Facebook thing. I have just come upon your blog via Frank’s Jottings and read most of it on this sunny, warm Saturday morning esconced in the south west of France with a rather nice view of the snow capped Pyrenees. Wow! Feeling your pain with the world, it was ever thus but now the world keeps butting in via electronic signals. I will now top up the bird feeder, finish breakfast on the terrace, walk our dog Chico and then dig the veg plot whilst listening to the birds and breathing some fresh, clean air tinged with odoure d’cow manure. Superb modelling by the way. I shall return!! Hi there! Thank you for commenting, and I’m sorry I didn’t notice you had until just the other day. I’m having WordPress plugin issues that have stopped the blog letting me know I’ve had comments, so I missed it. I’m trying to sort that out presently, but I do so dislike having to root around in the nether regions of my server. Why, oh why, can’t these things be simpler?